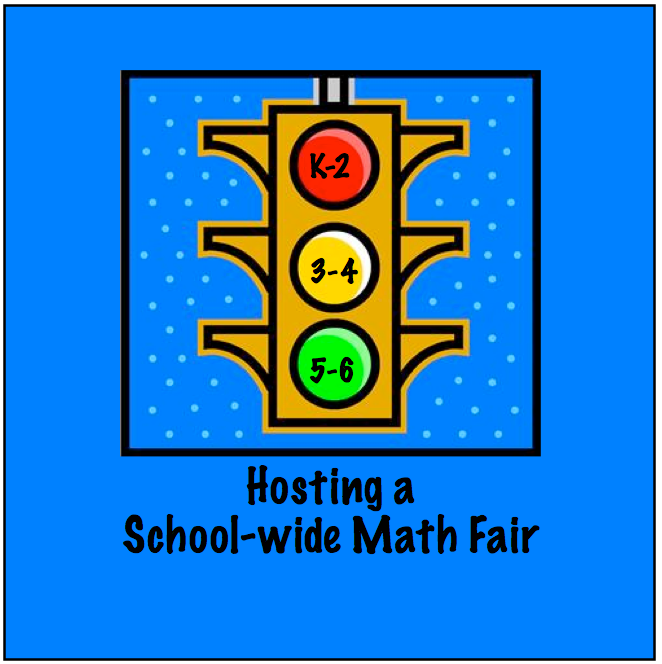 Desktop Learning Adventures: You, too, can host a school-wide math fair! 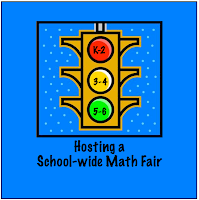 You, too, can host a school-wide math fair! I’ve had some really good teammates over the years. They’ve mostly been amenable to my *great* ideas. I had one teammate, when he was still relatively new to the team, ask, “How do you tell Pam, no?” I’m really not used to hearing that word, but I guess there are times... Hmmm, I can’t really think of a good time to tell me no. Anyway, Math Fair was one of those times. I was in the middle of my masters program and completely inspired by one of my math classes. I wanted to share my enthusiasm by showing teachers and students that kids could and should like math. What better way than to have a math fair for the entire school, sponsored by 5/6? (We were multi-age that year.) I would be happy to organize it. They said, (wait for it...) “no”. I’m sure they had a good reason at the time, but I stopped listening after, NO. Fine, then I would have a math fair for my teammates’ classes and show them exactly how it could work. 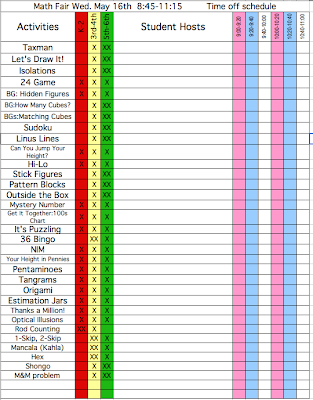 Since there were only four 5/6 classrooms, I figured the library would be the best place to have it, so I set a date that worked for everyone, and blocked out two hours for the first official Math Fair at our school. Next, the plan. 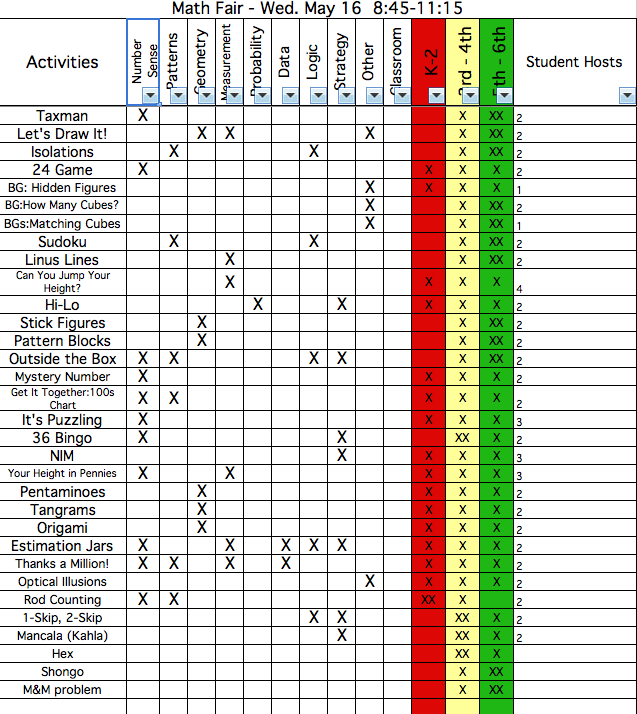 There would be activities from every math strand, and enough for two to three of my students managing each event. I wanted to give my students an opportunity to visit the different tables, so the schedule included a 20 minute break for each person. 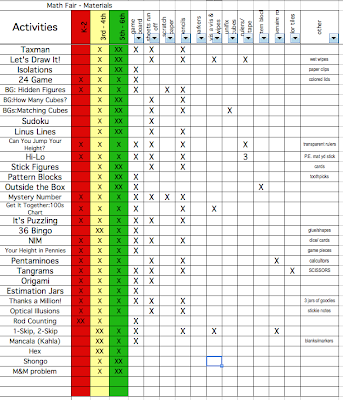 Since this was the end of the school year, coming up with activities was easy. I just pulled from everything we had done that year. My math “bible” has always been About Teaching Mathematics by Marilyn Burns. 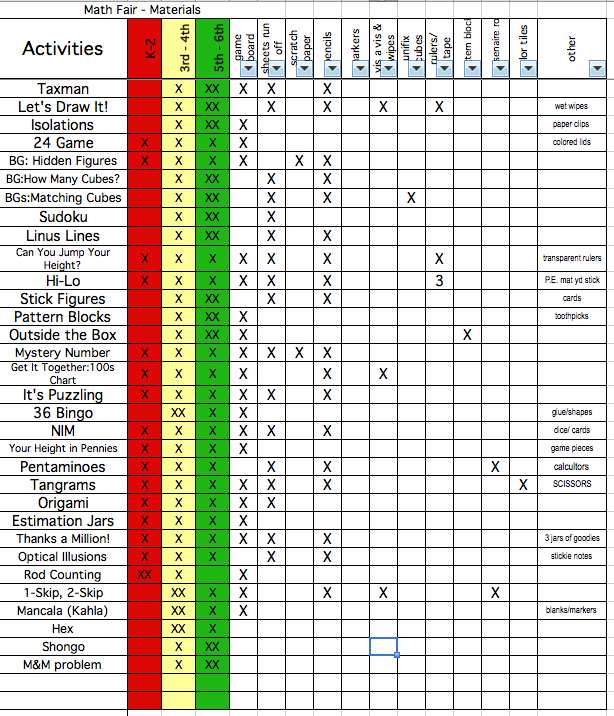 Between activities from there, her other publications, as well as my other go-to resources, Get It Together, Math Problems for Groups from Equals, NCTM’s Addenda Series K-6, and various puzzles and challenges from other books, I had more than enough to choose from. The event was a huge success! Our visiting classes were scheduled for 30 minute blocks of time, but every class stayed longer. The other classes passed by on their way to Specials (Art, Music & PE) and wanted to know why they couldn’t come. My teammates were sold. The following year, the entire team hosted a school-wide math fair. The organization was primarily the same, except we were adding different age ranges, K-6. 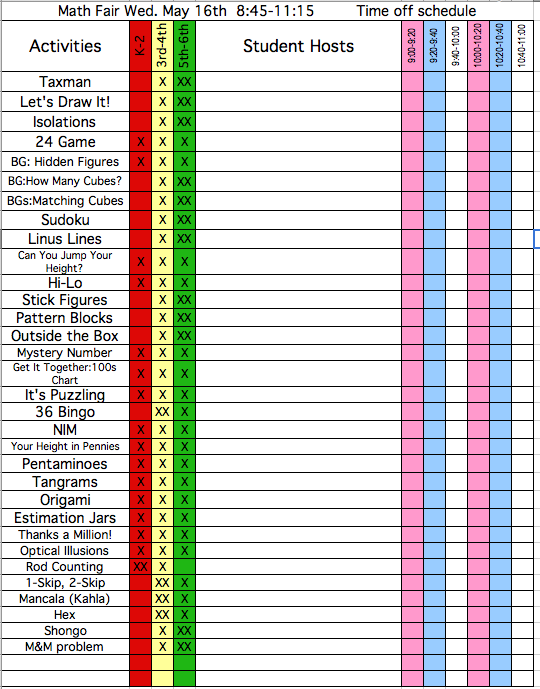 My teammates had a choice of bringing their own favorite math games and activities, or using some that I had available. Kids chose their activity and were scheduled for their time off to visit the other tables. Each classroom was responsible for setting up their own tables with signs and materials needed. 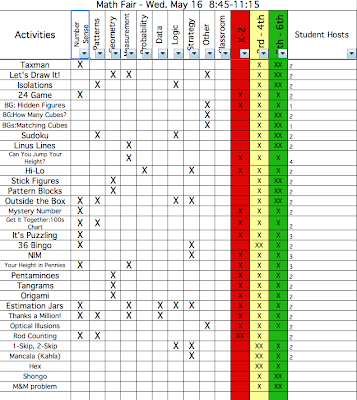 We used a stoplight sign at each activity to let students know what activities were designed for their grade level, again covering every math strand. Overlapping was fine. No one was turned away from an activity because of their grade level. As we prepared, I showed my students how to modify some of the activities for younger kids. This time, we definitely needed more room than the library, so I drew a set-up map of the gym showing everyone where they would be located. Guest classes were sent an invitation with instructions on how to sign up for a block of time and information on the stoplights and appropriate math levels, as well as a copy of the set-up map. A note went home to parents, inviting them to participate, also. kids would be turned away if they wanted to try something out of their range. During Math Fair, I used the overhead to post cool number facts on the screen, and we played classical music through the gym's sound system. There were estimation jars, one donated from each of our four sponsoring classrooms, where kids could estimate the number of contents and win. Again, a huge success with classes asking if they could stay longer. An Addenda~ I love it when things come together, although this could have come before I posted the blog the first time. This was an interesting YouTube video about the state of math and science in our country. I see it as another reason to have an All-School Math Fair! Oh my goodness - I LOVE LOVE LOVE this idea. May I steal it and see if anyone wants to do it at our school? The secondary department have a math and science week every year at school but primary has never done anything like this. It's an AWESOME idea!! Thanks, Lynn. :) Of course you can use this. If you have any questions, I'd be happy to help. I'd love to know how it turned out. Wow! This is a fantastic way to run a math fair! The classical music and the overhead number facts really put this over the top. You always share the coolest ideas, Pam.